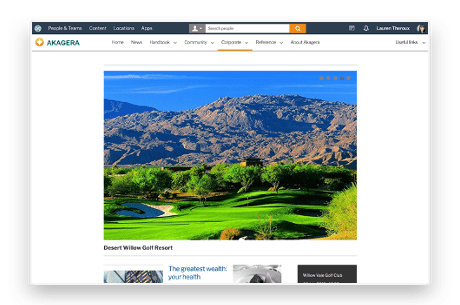 Enable people to excel in their roles by providing them with an intranet that delivers relevant, up-to-date business information and documentation, using our powerful content publishing and search functions. Ensure your content meets all your branding guidelines whilst engaging users with attractive, customisable design features. Trust our SaaS Agile model to provide continuous improvement and seamlessly adapt our product to your changing business requirements. Invotra People offers a fantastic directory powered by data contained in existing HR systems and employee directory services. 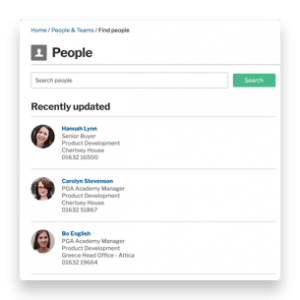 Using our people directory staff are able to locate and interact with each other quickly and easily. Our directory applications are available for people, teams and locations which allows staff to find a colleague based on this criteria or through our fast, simple search functionality. Ensure organisation wide communications are effective, dynamic and relevant to every audience with our analytic tools, dashboards and targeted content. Easy to use layout management features and instant access to branding change tools, from colours to logos, make your intranet design identifiable and current. Push information to those who need it, promote important events and use features such as newsfeed to ensure the conversation can flow without those involved missing a thing. Encourage teams to create content and work on projects across departments and hierarchies with our enterprise collaborative software. Simplify teamwork, cross-departmental projects and knowledge sharing, with documents stored in public, private or secret groups that are open to contributions from all members. 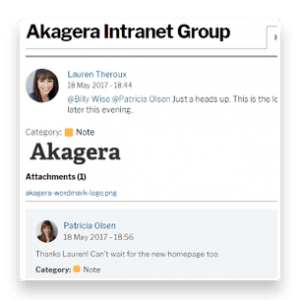 Content creation for your intranet can be an organisation-wide effort with publishing responsibilities easily granted and managed for all your employees. Sharing ideas and initiating discussions within our social applications ensures everyone is involved, engaged and up-to-date with developments in your organisation. Our Message Wall allows informal and fun communications across organisations, teams and hierarchies. Applications such as Groups, Blogs and Events enable everyone in your company to share and publish knowledge and information and use engaging features, such as @mentioning and hashtags, to facilitate communication between individual colleagues, teams, groups or the whole organisation. Our added feature of dashboards also allows you to measure engagement within teams, locations and individuals. Providing for your publishing team’s requirements – an extensive set of content types and easily customisable templates and widgets; Invotra Intranet makes editing and publishing simple. Fast and effective management of workflow, compliance and policy is achieved with ease. 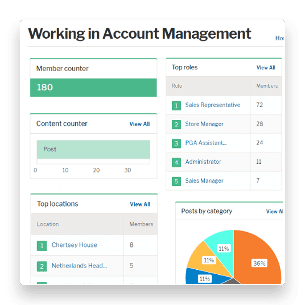 Collaboration in editing and the distribution of publishing roles is enabled throughout our intranet, making it the comprehensive answer to your content management needs. Invotra comes with built-in analytical dashboards to enable organisations to monitor how each of the applications is performing. Track and measure the engagement of your users and their teams with the dashboards, which are available on each of our applications. 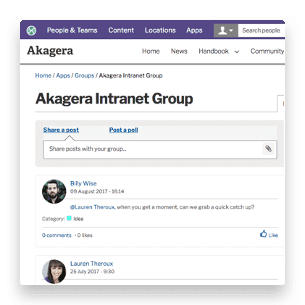 Learn how your employees are interacting with each other and the content of your intranet and allow them to shape the intranet they need.